This series presents information based in part on theory and conjecture. The producer’s purpose is to suggest some possible explanations, but not necessarily the only ones to the mysteries we will examine. — Opening Narration to In Search Of . . .
1970s pop culture was a bubbling cauldron of conspiracy theories, pseudo-science, New Age spiritualism, and purported paranormal phenomenon. For anyone interested in that era, no TV program better explores these various popular fads than the classic television documentary series In Search of . . . , which ran from 1977 to 1982, narrated by Leonard Nimoy, and produced by Alan Landsburg. The entire first season is available for viewing on my YouTube channel. See links below. Over the course of four hour-long specials and 144 half-hour syndicated episodes, In Search of . . . explored just about every far-out idea ever to come out of the 1960s and 1970s. Then-popular theories about ancient astronauts, talking to plants, killer bees, Bigfoot, the Loch Ness Monster, Dracula, Nazis, Amelia Earhart, E.S.P., Atlantis, the Bermuda Triangle, and more, were all treated as serious phenomenon. In most episodes, In Search of . . . is explanatory in its approach to these topics rather than investigative, so if something sounds preposterous and unbelievable the producers leave it to the audience to make up their own minds. Extraterrestrials, Magic & Witchcraft, Missing Persons, Myths & Monsters, Lost Civilizations, Special Phenomena. — Teaser/Tag to In Search Of . . . 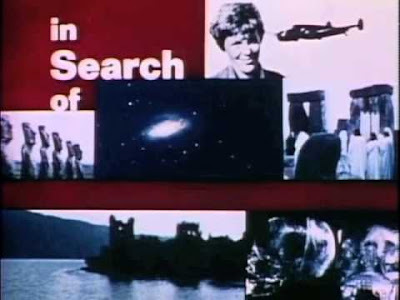 Despite the sensational nature of the show, In Search of… did produce a number of excellent scholarly programs, some of which are included in the first season episodes presented below. The episodes on Incan treasure, killer bees, and the historical Dracula are some of the stand-out episodes in this regard. Nevertheless, the more fantastical episodes on so-called ancient astronauts, Atlantis, the Bermuda Triangle, etc., give credence to myths without any substantive evidence to back it up. It is particularly displeasing to see the ancient astronaut theory continue to be promulgated today. Wild-haired experts with dubious academic credentials, or none at all, have found fame on cable networks hawking preposterous theories that have long been discredited. All this does is to steal the honor due to the ancient cultures who devised the technology and put money into the pockets of people who can only be described as charlatans. Nevertheless, I have a real fondness for In Search of . . . . Whether real history and science or just unfounded speculation, the episodes are always compelling entertainment to watch. Part of it is the excellent writing and Nimoy’s basso profundo narration, but also the film production values are outstanding and the music by W. Michael Lewis and Laurin Rinder always strikes the right chord and mood. The rights to In Search of . . . were lost by the original production company, Alan Landsburg Productions, who let them lapse. Subsequently, the show found its way into the hands of a wider audience. I have posted the 24 first season episodes and the first two 1-hour specials to my YouTube Channel. Interestingly, the two 1-hour specials were narrated by Rod Serling who was to be the narrator for the series until his untimely death at age 50 in 1976. The regular series episodes presented below are digital transfers of 16-mm film originals reportedly found in the archives of a TV station who syndicated the program during its original run. For several episodes, where indicated, one will find links to articles I wrote where the videos are embedded while other links take the reader directly to the YouTube post. Are plants empathetic to emotions? Recent studies disprove most earlier research, but this remains an intriguing episode to kick off the series. Was the Oracle Chamber beneath Mystery Hill in New Hampshire built by ancient Phoenicians? The Nazca Lines in Peru. Some say they were built for ancient astronauts, but ISO also suggests the ancient Peruvians had hot air balloon technology, among other theories. An exploration of the graveyard of the Atlantic. This episode absolutely frightened me as a teenager. The 1970s saw an explosion of interest in this mythical creature. This episode looks at some classic accounts. The history and predictions of these aggressive insects, many of which have come true. The big one is coming – and the 1970s were terrified! The widely popular U.S. exhibition of King Tut’s treasure ended just before this episode aired. An early warning of the dangers of climate change with some solid scientific speculation. An exploration of the theories behind the legend of the mythical lost continent. Can technology help us connect to other life in the universe? The search for lost Nazi’s treasure continues to this day. Most of the theories presented in this episode have been discredited, but there are a few rational explanations as well. The real man and the myth. How were Easter Island moai erected and what happened to the culture that created them? Parapsychologists interpret “spectral sightings” as real experiences. What happens in near death experiences? Tall tales, "eye witness" accounts, and serious researchers highlight this episode, including a young Dr. Robert Ballard, the man who found the Titanic! Various eyewitness accounts are reported, including some high-profile cases. Priests and followers of this mysterious practice are investigated, including footage and music of ceremonial practices. An episode featuring real archeology and science – the ISO team joins a researcher who makes an important discovery about this lost civilization. Scholarly inquiry and paranormal speculation summarizes beliefs about this ancient structure up through the 1970s.